Glonik Hotels is a 3-Star hotel situated at 118/120 Adeniyi Jones Avenue, Lagos, Nigeria. It is in a secure and private area to ensure the maximum safety of its guests. Glonik Hotel is situated 20 minutes from Murtala Mohammed International Airport and Ikeja Shopping Mall. Room categories at Glonik Hotel include: Bronze Standard Room, Standard Platinum Room, Luxury Villa, Executive Diamond Suites, Executive Royal Suites and Executive Erica’s Suite. 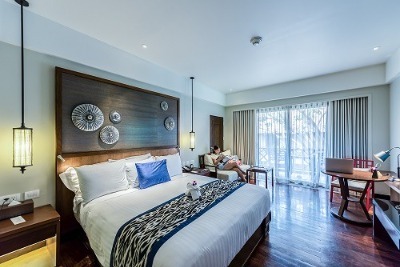 Each room is well furnished with bedside drawers, beautiful and comfortable bedding, and air-conditioner. Rooms also feature an en-suite bathroom and bathroom fittings suitable for guests. Glonik Hotel has two bars: The open bar serves varieties while the inner bar provides VIP treat; both are well stocked to serve guests. The bars are fully stocked with exotic wine, all types of spirit, champagne, and non-alcoholic drinks. There is a restaurant where guests can order meals. It also offers buffet and a la carte menu. Glonik Hotel offers additional services on requests, such as: Free airport shuttle - complimentary with MOPOL, safety deposit boxes, laundry/dry cleaning, car hire, and 24 hours room service. Glonik hall seats 250 people and it is fully air conditioned. Their conference hall is equally fully equipped. Part of the operation now involves picking and dropping most guests within Lagos metropolis free of charge. The premises are well secured by security personnel. Glonik Hotel has a tour package that includes guiding tourists to places of interest within and outside Lagos State. It has catalogued places of attraction in Nigeria, to deliver a wonderful itinerary to visitors who wish to experience Nigerian culture and dynamic natural attractions. Q: Does Glonik hotel offer free Wi-Fi? A: No, Glonik hotel does not offer free Wi-Fi to all checked in guests. Q: Does Glonik hotel have a swimming pool? Q: Does Glonik hotel offer complimentary breakfast? A: No, guests will be charged for breakfast orders. Q: Is there a fitness centre/gym at Glonik hotel? what type of equipment are available? Q: Does Glonik hotel have a restaurant? Glonik Hotels is a budget hotel in Ikeja, Lagos. It was a fun packed experience with everything I needed to feel at home was in the room and the environment of the hotel. Lovely location and very easy to locate, I didn't need to ask for much directions before I located the hotel. Have nice pictures of Glonik Hotels?